Fly into Windhoek, Namibia from Johannesburg, South Africa late at night, and you’ll wonder if the plane has taken a wrong turn. There are no lights below save a few flickers that might be figments of your imagination. Where is the big, bustling capital city of Windhoek? Will the plane literally land in the middle of the dark desert and fly away? Luckily, after arrival, you’ll find that Windhoek is in fact a real city—it’s just thirty minutes away from its airport. But the sense of desolation—of vast emptiness—that you first experienced flying in will stay with you. Namibia is an Arkansas-sized country that is home to approximately 3 million people, most of which live in the capital city or along the Atlantic coast, where fishing is a major industry. But the rest of the country, in the expanses of ancient desert and savannah in between, belongs to the animals. Many of the creatures that live here have adapted to the arid, dry climate and landscape. From May to November, also known as the ‘dry season,’ rainfall is extremely limited. The animals rely on the ‘wet season,’ from December to April, for nourishment. But the past few wet seasons have not brought the rain that is needed, and the country’s drought is expected to intensify with the effects of climate change. Will the animals here be able to adapt and survive? How can we help them? These are questions that we’ve come to explore with Virginia Tech graduate student David Millican, a Ph.D. student in the department of biological sciences at Virginia Tech, and a rising star in the field of bird conservation. He is a fellow in the university’s Interfaces of Global Change program, and a crucial member of the new Global Change Center housed in the Fralin Life Science Institute. David’s Virginia Tech advisor is Dr. Jeff Walters, a renowned bird biologist who specializes in studying cavity-dwelling bird species. As part of the Walters lab, David is researching cavity-dwelling species that live here in Namibia. Follow along as we head out into the field with him. The symposium provided researchers and practitioners with an overview of international naturalistic driving studies, a method designed to track driver behavior in real-time. Panelists discussed their research findings from a variety of vehicle types and driver demographics, including automated and connected vehicles, teen drivers, and motorcycles. Guests also interacted with panelists to discuss naturalistic driving in their respective countries and gained insight into the next generation of naturalistic driving studies. The symposium was followed by a motorcycle research and technology workshop and a seminar focused on women in transportation, for which Deborah Hersman of the National Safety Council and Ann Brach of the Transportation Research Board both served as keynote speakers. Blanco noted that the motorcycle workshop and women in transportation seminar, both in their inaugural year, gave students an exclusive chance to engage with industry professionals. “The Motorcycle Research and Technology Workshop and the Women in Transportation Seminar were first-ever events that brought together leaders in their fields and provided unique opportunities for professionals and students to advance their knowledge of these industries,” said Blanco. Virginia Tech Transportation Institute would like to thank the following conference sponsors for their support. As U.S. Sen. Mark Warner discovered this week, the Virginia Tech Transportation Institute-affiliated Global Center for Automotive Performance Simulation is driving the latest advancements in tire and vehicle testing, modeling, and simulation for the next generation of vehicles. On August 16, Warner visited the center to get a first-hand look at its endeavors in enhancing tire and vehicle design and its economic impact on the Southern Virginia region. He also discussed automated-vehicle research performed by the Virginia Tech Transportation Institute, going for a spin around the Virginia International Raceway in an institute-owned semi-automated Tesla Model S.
“I think what we’re looking at here between GCAPS [the Global Center for Automotive Performance Simulation], Virginia Tech, and VIR is actually the future of driving,” said Warner after completing the test run in the Tesla. The senator has been an avid supporter of research and investment in unmanned systems. The Global Center for Automotive Performance Simulation, a collaborative effort led by the Virginia Tech Transportation Institute, provides advanced tire research, vehicle simulation, and mathematical modeling for virtual vehicle and tire designs. By driving and braking tires under a variety of simulated conditions in a controlled environment, for instance, center engineers can put realistic forces on tires up to speeds of 200 miles an hour. The center also works with other centers at the institute to model automated cars of the future. During his visit, Warner also received an update about the center’s current and potential economic impact in the Commonwealth, with the center expected to bring in $147 million into the Southern Virginia region during its first 10 years of operation and 183 jobs by 2020. 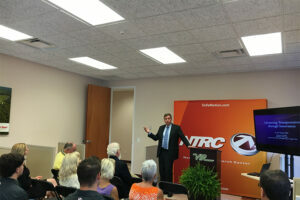 To date, the center has attracted more than 30 global customers to the area. Automated-vehicle research initiatives, according to Warner, has the potential to further propel economic development in Virginia. Sen. Warner visited the Global Center for Automotive Performance Simulation as part of a four-day tour throughout the Commonwealth to discuss ideas to enhance Virginia’s economy, tourism, and care for veterans. Former Virginia Tech President Charles Steger’s dissertation is 339 pages long. But it doesn’t take up an inch of shelf space at Virginia Tech’s Newman Library. That’s because it is available online at VTechWork’s Electronic Theses and Dissertations collection. Virginia Tech was the first university on Earth to mandate that graduate students use an ETD system. Currently, the system is a package designed to obtain electronic approvals from committee members and the graduate school and deposit the thesis or dissertation at the library for electronic access and storage. Since its launch, the ETD publishing procedures at Virginia Tech have been flexible and allow students to designate varying levels of access to their thesis or dissertation. People all over the world can query the database at VTechWorks and download the thesis or dissertation for viewing on their personal computer. Professor Gail McMillan at Virginia Tech’s Libraries, Professor of Computer Science Ed Fox, and former Associate Provost for Graduate Studies John Eaton collaborated to launch this innovation. The ETD initiative began in the 90s with discussions across the library, departments and graduate school and with external collaborators at other universities. After two years of testing, on April 5, 1996, Jinxia Sun became the first student to deposit a dissertation in the system titled Characterization of Organosilicone Surfactants and Their Effects on Sulfonylurea Herbicide Activity. Sun is now a Virginia Tech alumna and a research manager at Croda in Delaware where she heads up teams to develop agricultural applications of surfactants . Since becoming mandatory on January 1, 1997, over 27,160 ETDs have been added to the collection. This number includes some bound theses and dissertations that the library pulled off the shelf, scanned and uploaded to VTechWorks’ ETD collection. The ETD initiative was the “most important and effective” change that made research more open said Fox. Virginia Tech’s motivation to move from bound theses and dissertations to online versions was rooted in our mission as a land-grant university to share the knowledge created by our scholars with the public. 2. space savings at the library. Unlike a printed document sitting on a shelf, the ETD database archives diverse file types. Since Virginia Tech formally launched the ETD initiative in 1997, hundreds of universities all over the world have followed suit. The ETD initiative is about more than just storage, though. It teaches graduate students about the responsible conduct of research. The ETD initiative has certainly proven to improve accessibility to research. The data files for Glen R. Gibson’s dissertation titled “War and Agriculture: Three Decades of Agricultural Land Use and Land Cover Change in Iraq” have been accessed more than 3,500 times. The ETD initiative has also improved the richness of graduate students’ thesis or dissertation. From the beginning, students have taken advantage of the ability to deposit any kind of file that showcases the scope of their research. Unlike the dissertations of President Steger’s era, today, ETDs can contain color photographs, videos, websites, non­standard page sizes, raw data files or code. Fox’s Ph.D. student, Uma Murthy, created a tool that helps a user identify fish. She deposited her code and fish database along with her electronic dissertation so that future users can access the fish ID tool. On January 1, 2017, Virgnia Tech’s ETD initiative will celebrate its 20th anniversary. As a virtual resource, it is awkward to throw a party for something that doesn’t have a physical form. There won’t be a party with cake and balloons. But we can still celebrate. The best way to honor the achievement is to use it. Pull out your laptop, tablet or phone and browse the scholarly work of Virginia Tech’s community.